A tope is a head first lunging attack. It's most of seen as a dive, when a luchador will go fly thru the ropes to knock over his opponent. 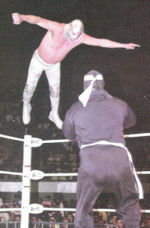 Topes can also be done in the ring, from the top rope or on the run. Topes out of the ring can also be done thru the ropes, over the ropes, from the top rope, and thru the corner ropes. Fast tope suicidas are often called Bullet Tope Suicidas. Topes where the attacker doesn't put their own hands up to block blow are sometimes called La Dormilona. Topes with a forward spin are called Tope con Giro. This page was last edited on 10 April 2018, at 09:38.